"You don't live in the real world . . . From what you've told me, I don't think you ever have. You're like me. You live inside this illusion." "[The OASIS] had become a self-imposed prison for humanity . . . A pleasant place for the world to hide from its problems while human civilization slowly collapses, primarily due to neglect." 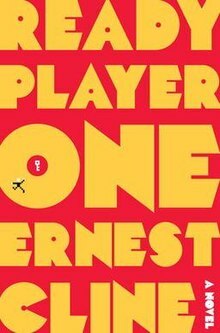 Ready Player One can be summed up as 80s nostalgia meets Tron and The Matrix. I was so eager to read this book after hearing glowing reviews, and then I was further motivated by seeing the movie trailer (book before movie is my mantra!). Overall, I give it a 3 to 3.5 star rating. Unfortunately, fate did not smile on me and allow me to grow up in the 80s. I did, however, grow up on 80s music and pop culture thanks to my parents, and though I'm no Parzival when it comes to 80s culture knowledge, I do love me some Duran Duran and Dirty Dancing. I may have caught only half of the 80s cultural references in the book, but my little nerd heart smiled at every one of them and longed for that decade I wasn't old enough to experience. The idea of a society infatuated with 80s nostalgia was super fun--definitely a strength in the novel. I also loved the post-apocalyptic vibes. There's not one major catastrophe that causes the overall decaying state in Cline's fictional 2044, but more of a series of plausible events: energy crises, wars, poverty, etc. It was all fairly believable. And then you add in the OASIS, a virtual reality that allows for the ultimate escapism experience. With the technology we have today, none of this seems far-fetched, and I'm simultaneously fascinated and disturbed by this. I enjoyed thinking about the possibilities of a virtual reality like OASIS. The OASIS is truly a computer geek's paradise: if you can imagine it, you can make it so. As a nerd--albeit a literary/artistic nerd, not a math/science nerd--this was exciting to envision. You want to have a DeLorean for a spaceship? You got it. You want to live in a castle with a dragon guarding the drawbridge? It's yours with a few programming tweaks. I also loved dwelling on the deeper themes in the book: What is identity? What makes you, you? In a society that's super "connected" thanks to social media, people can strike up friendships and relationships without having an in-person conversation. Does that allow for a deeper, cerebral connection, without distractions of the physical? Do appearances matter? Also, the idea of taking responsibility for the state of the world was sprinkled throughout. Humanity can't run and hide in a computer game; it has to work to repair the destruction to make Earth a place worth living in for generations to come. I didn't love the writing style. Although I appreciated all the nerd culture and technological details, there were parts that got a little too detailed for my liking. It kind of disrupted the pacing, and made me want to race through those sections. Again, if I was a computer programming nerd and not a word nerd, this may have been a non-issue for me. I missed the human (avatar) interaction. It's there--Parzival/Wade does hang out with other people and talk to them, but it's few and far between the detailed, solo missions he's tackling on his own. I really missed the dialogue that helps move a story along. Overall, it was a really interesting read, and it got me excited about seeing the movie. Would definitely recommend to 80s culture connoisseurs and self-professed nerds/geeks.